First off, I know it's not normal to take photos in a public bathroom, but I couldn't resist. I checked for feet under the stalls - none. I peeked down the hallway - no one coming. Eeeeeeee! I was so excited it's a good thing facilities were at hand. The Ritz bathroom! 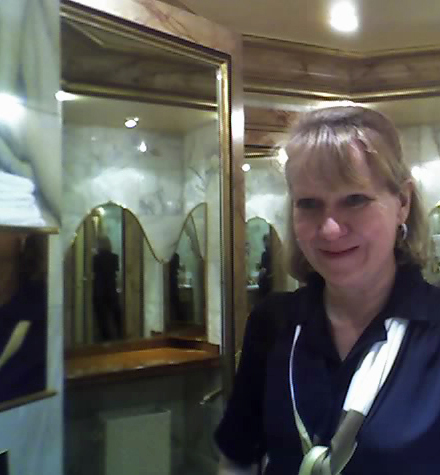 The Ritz bathroom in Paris! What could be more fabulous for a Paris nut like me? Maybe Hemingway or Gershwin used the bathroom here (well, not the ladies room) - maybe Chanel or Audrey Hepburn. The Ritz is one of those places that doesn't seem real and it was such a thrill to be there, I needed a photo. Well, it didn't seem like good form to take a snap while people were enjoying their evening in the bar, so I settled for a bathroom shot. Then, I decided to take myself taking the picture. (Good thing my phone has a camera - would have been trickier with a camera bag and tripod). 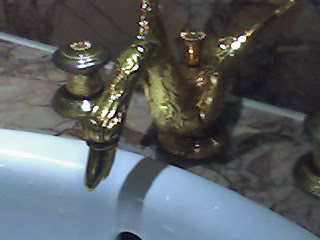 There are probably a lot of fancier bar bathrooms in other hotels, but other hotels aren't The Ritz!